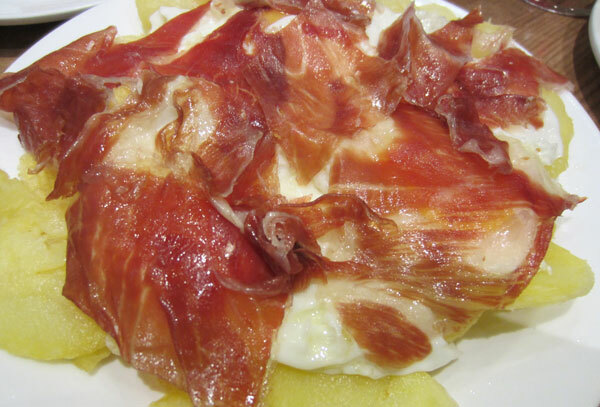 The thought of Spanish food gives me little foodie heart flutters of delight! And when I get to eat Spanish food in Spain then I am one happy Iberian piggie! I have engaged in a rather sluttish Spanish affair over the last month which has taken me from tapas bars in San Sebastian to beachfront dining in Barcelona and finally overindulgence in the markets of Madrid. And was it worth it? 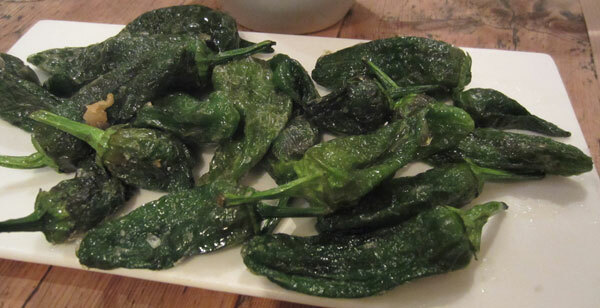 Absolutely, down to every last pimientos de Padrón! It was my first time to San Sebastian and it was fleeting. Only having one day in this vibrant coastal town I didn’t want to waste anytime and headed straight for the old town where laneways are lined with tapas bar after tapas bar. Windows dressed with fresh seafood and legs of Iberian ham, I was mopping up my drooling mouth! 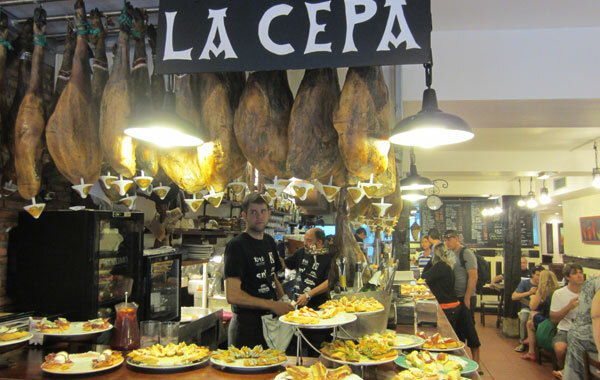 We settled on Bar La Cepa as I had read positive reviews of this traditional tapas establishment and wanted to give it a try. It was bustling with people eating at the bar and seated at tables in the narrow restaurant space. We managed to grab a table and then one by one went to feast our eyes on the offerings laid out on the bar. The tapas selection is rather extensive and the plates they hand you are rather large! So there is only one way forward – to fill it! I had no problems in doing so. 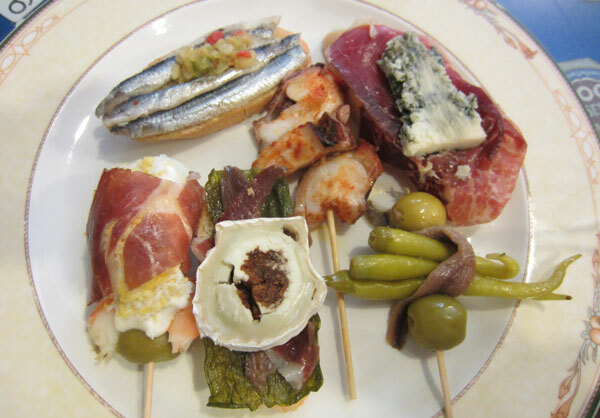 I was particularly taken by the crusty baguette topped with green pepper, anchovies, a slice of jamon and a generous round of creamy goats cheese, succulent pieces of marinated octopus, and juicy green olives and prawns with lashings of cream cheese and jamon. Potent blue cheese atop a slice of jamon on a baguette was pretty punchy, sardines dressed with garlic and peppers a classic and delicious. I’d be lying in saying that I settled with the plate above! It’s just too easy to go back to the bar for more! So after a second round I was well and truly stuffed and completely satisfied with my tapas fix. And at €1.60/piece there is no shame in being a little piggy. 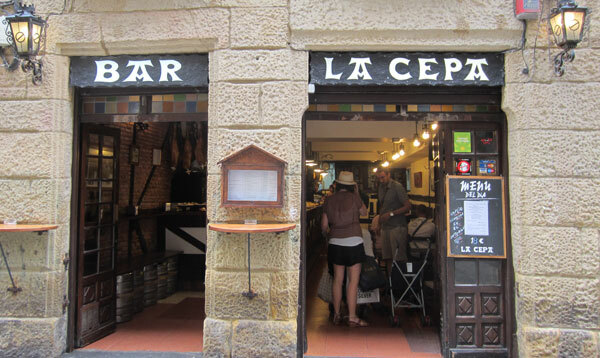 Very fresh, great selection and traditional setting I would definitely recommend Bar La Cepa for a tasty tapas experience. Barcelona will always be my first Spanish lover, and I have to admit my one true Spanish love! The crazy ramblings of Las Ramblas, the cobbled laneways of Barri Gotic, the bustling stalls of deliciousness at the la Boqueria Market – I love it all. And the food and dining options are endless. 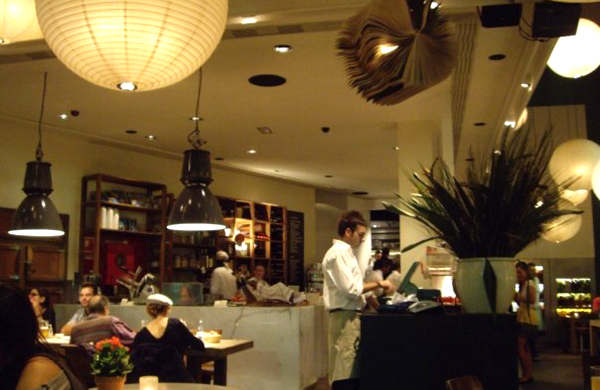 One of my fav restaurant spots in Barce is just off Las Ramblas and also close to the Market. Located in a trendy little square, Bar Lobo is modern yet unpretentious and serves up contemporary tapas, sumptuous salads and wholesome main dishes. With outside dining available and two floors of interior dining space it can accommodate parties of all sizes. I instantly liked the vibe of this place, with large solid wood tables and magazine art plastered on the walls, an open bar space, beautiful arrangements of fresh flowers and oversized bowls laden with citrus fruit. It is a far cry from your traditional Spanish tapas bar. On this visit to Bar Lobo we were quite a large group so we ordered a selection of the delicious tapas, a plate of Spanish meats and a couple of accompanying salads. The tapas really are outstanding. 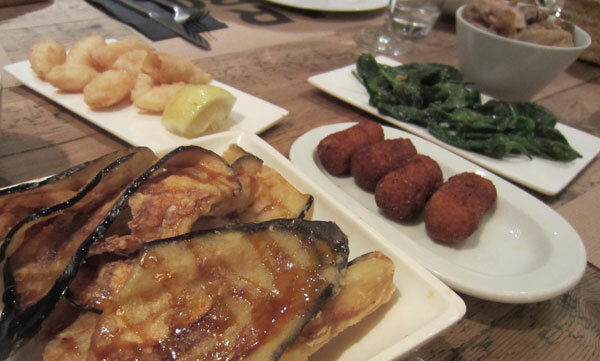 Favourites included the delicately grilled slices of aubergine drizzled with honey, lightly battered and fried baby squid (so good we had to order two more portions), blistering and salted pimientos de Padrón and you can’t go wrong with a good helping of patatas bravas. Bar Lobo is very reasonably priced, the service can be a little brash but the food and setting make up for it. Madrid is big, it’s spread-out and it was hot! It lacks the intimacy and charm of Barcelona or San Sebastian but I did a little sniffing around and came up with some very worthwhile foodie forays. 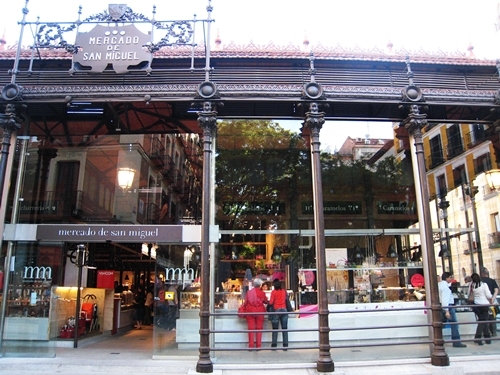 An absolute must do in Madrid is the Mercado de San Miguel – a stunningly restored 19th century building housing 33 vendors under a soaring wood-and-iron roof. But what is ingenious about this market is that it boasts the perfect balance between offering amazing fresh produce to buy and take home and also being able to enjoy all tasty morsels whilst you shop. In the centre of the market high bar tables and stools gather locals and visitors to eat their plates piled high with tapas selections, fresh oysters, paella, sweet pastries and accompanied by a crisp vino or refreshing beer. 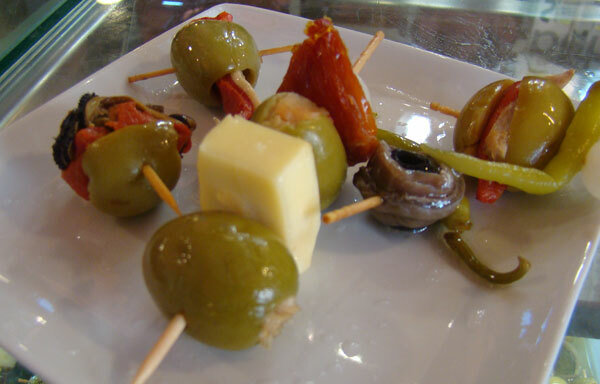 I was immediately drawn to the olive stall with an array of juicy green olives pintxos incorporating seafood, peppers, cheese and more. At €1-€2 each you can afford to try a few. A tapas bar at one end of the market was crowded with people indulging at the bar lined with plates of tantalising tapas, Spanish omelette, and fresh seafood. 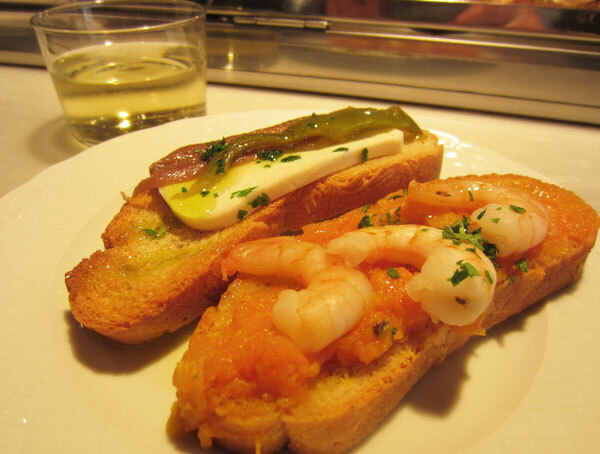 I ordered a glass of Rioja and got stuck into some prawns on a bed of sweet potato and mozzarella with anchovies. €2 each for the tapas and a glass of wine for €3. 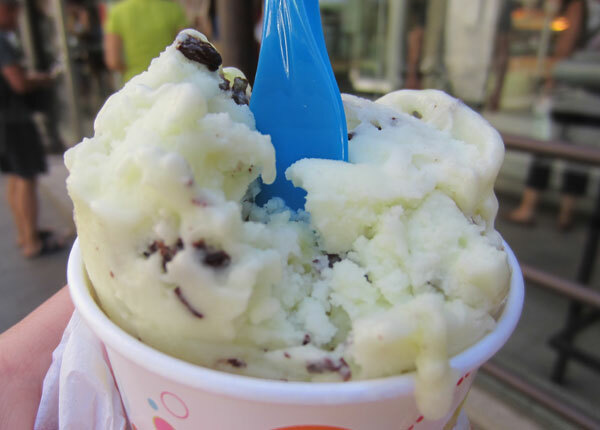 I couldn’t leave the market without a sweet treat and a refreshing lemon sorbet with chocolate chunks nicely rounded my market palette. 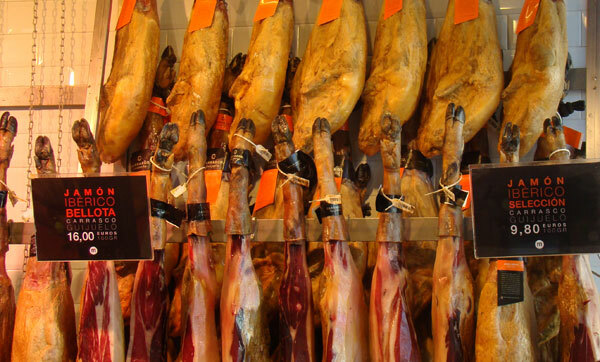 Open until 10 p.m. Monday to Wednesday, and 2 a.m. Thursday to Saturday, day or night the market is always bustling and a great way to experience the delicious tastes of Spain. 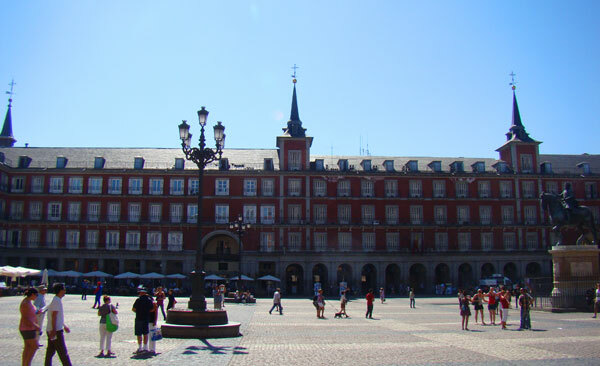 Just down from the Plaza Major in central Madrid, La Latina is an area bursting with tapas bars and a great spot to visit at night for a bite to eat and a drink or two at one of the many wine bars. 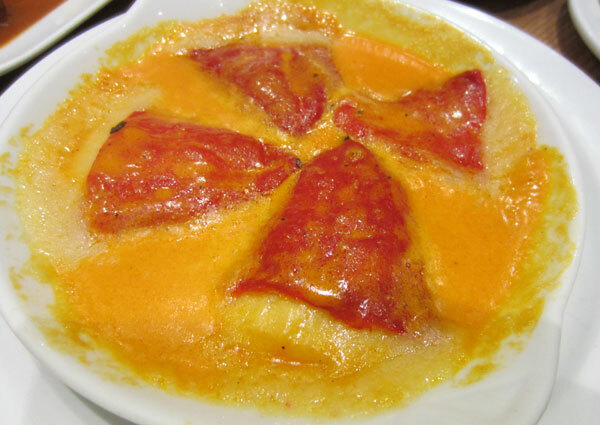 A long stretch of restaurants and bars is concentrated on the street of Cava Baja, we settled at La Peonza and got stuck into some Sangria and hearty dishes to share. Highlights were the Manchego eggs (pictured above) and the stuffed peppers (below) which oozed with sweet cheese and a hint of white fish. 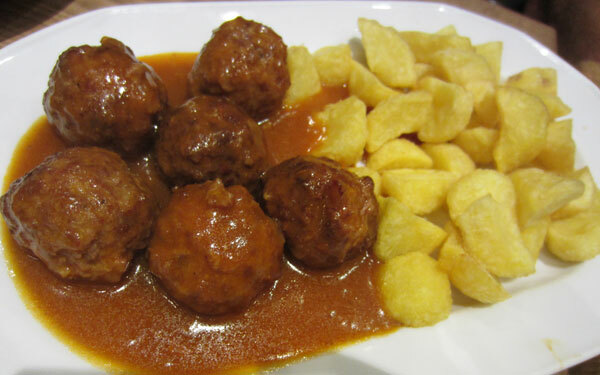 Iberian meatballs were juicy and crisp potato gems mopped up the rich gravy. Dishes ranged from €8-€12, the restaurant is basic and traditional in style and the menu offers a range of classic Spanish dishes to share. We were staying near the leafy tree lined streets of Salamanca which is an area boasting great shopping but also fabulous restaurants on every corner. For our last night in Madrid we stayed local and strolled up to Calle de Serrando for my last fix of Spanish loving. La Ursula was brimming with pavement dinners and was the perfect setting to enjoy the warmth of the lingering day’s heat, a jug of Sangria and some delicious food. Whole baby squid perfectly cooked and drowned in spiced oil and garlic was to die for. 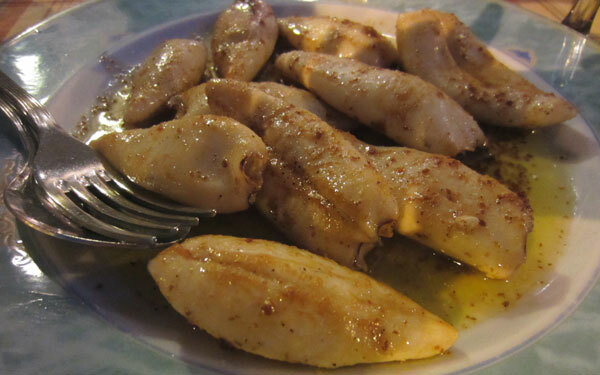 The Spanish sure know how to cook their squid, and the whole baby variety are so mouth wateringly juicy and tender. 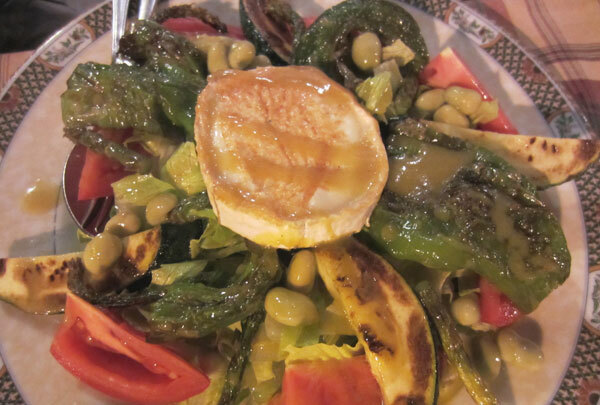 A goats cheese salad with grilled vegetables and lima beans was a perfect accompaniment to the salty meats and fish we were scoffing down. 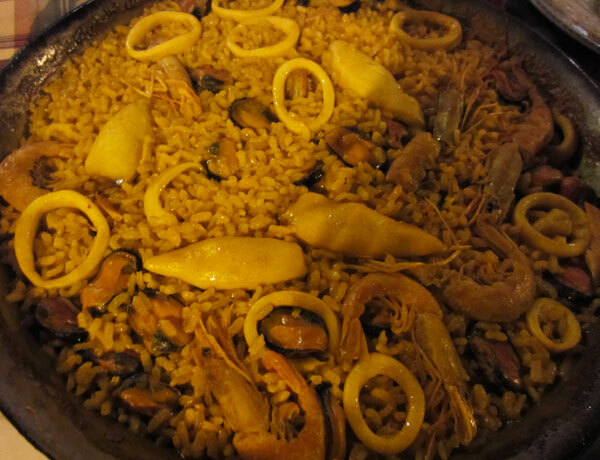 And I couldn’t leave Spain without indulging in a seafood paella. Packed with squid, prawns, muscles and cockles and heavily spiced with saffron and paprika, it was intense but very satisfying. Apparently our serving size was for two but after already filling up on several dishes prior I think it was more like a serving for six! A gluttonous Spanish affair is one I strongly recommend. Even if the adultery is fleeting – induldge at the first opportunity! that squid has a musty quality…as in must have more (thanks to C Wangerin for that pun). I can certainly say that the Spanish know how to make their squid ‘musty’!! Couldn’t get enough!